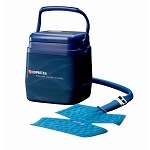 We carry a universal pad that works with the EB Ice system. 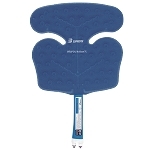 It is a simple plastic/foam pads that connect to the EBIce system and can be held in place with regular ace bandage or other materials. EBI brand pads are no longer available, but these pads will work with the EBIce system. The pads are a similar shape and size to the original EBI pads and are manufactured by Cincinnati Sub Zero (CSZ). The U-shaped Universal pad is 10" x 12". The small rectangular pad is about 5" x10".